As the end of 2013 draws to a close and the holiday season goes into full swing, Image Comics has been topping the charts on many “Best of 2013” lists. So to thank our fans for all their support, we wanted to do something extra special in honor of all our fantastic readers! 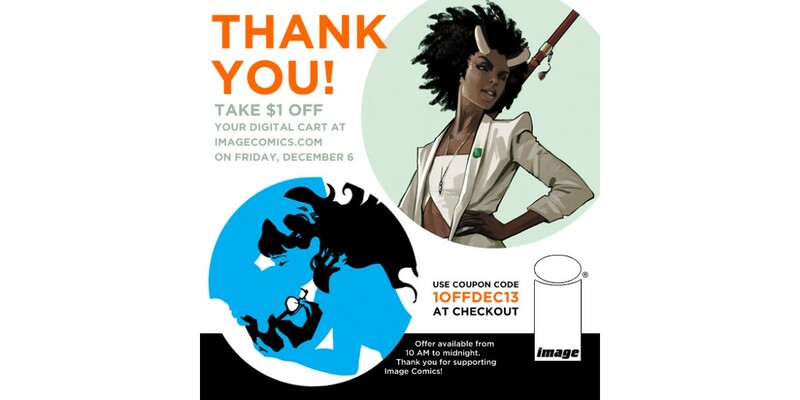 From 10 a.m. to midnight PST on Friday Dec. 6, enjoy $1 off your entire cart purchase at in the Image Comics Digital Store when you use the promo code 1OFFDEC13. We hope 2014 proves to be just as amazing! So what are you waiting for? Go get some comics and start saving!